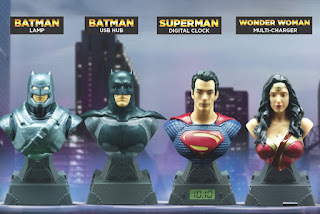 The Superman Digital Clock displays the date and time, and is adjustable via the set and mode buttons. This device is ready to use, as it has one set of batteries as part of the package. The Wonder Woman Multi-Charger has a coiled power plug at the bottom compartment, which you can connect to a laptop/computer. It comes with four different cable chargers for both iOS and Android devices. To avail of this new blockbuster promo, all you have to do is fuel up with any Petron Euro-4 gasoline or diesel fuel with Tri-Activ benefits. Every P 500 single or accumulated purchase entitles you to purchase one Batman v Superman: Dawn of Justice gadget collectible for only P 200. The promo will run from February 25 to March 31, 2016, at over 420 participating Petron stations nationwide. Reward na pay ka pa. Wag na kayo mag promo. nothing's free in this world man. but there's something i can guarantee that is absolutely free, our SALVATION, though it is costly to God but it is free to us. God bless u po! Wtf are you yapping about?